And that's exactly the way Martin is using it as he described in this recent blog post. 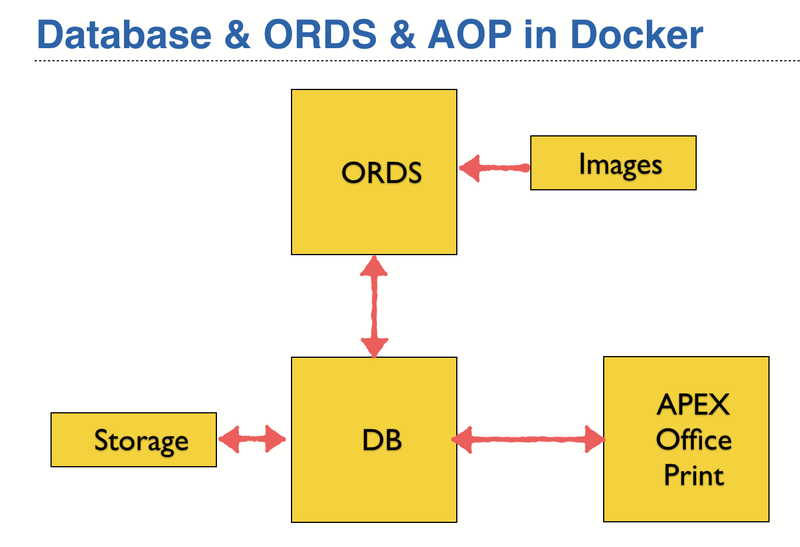 It is an ideal way to get up and running with an Oracle database in a Docker container in a very short time (you have to download 3.5 Gb, so dependent on your connection that might take some time). This works fine for a short PoC. But what if you want to be sure your container lives a bit longer than a week or two? Because, if your container gets blown away for some sort of reason, you will lose all your data. The original image is still there, but that contains just the starting situation. A.k.a. an empty database. And - from recent experience - I can tell you that containers can get destroyed (in this case by an upgrade of the Docker software). The whole concept of containers is that they are ephemeral, lasting for a short period of time. But luckily we can set up a Docker container in a way we are sure our data is safe, even when the container is destroyed. We can use volume mapping for that. So we don't need to download the complete installed database from the link Martin mentioned in his blog, but we need the Docker build files and the required Oracle database software and build the image ourselves. Exactly as Maria describes in her blogpost. But if we want to develop APEX applications, we need to have ORDS installed somewhere as well. Of course we could just run ORDS locally connecting to the (forwarded) port 1521. But it would be way nicer if ORDS would run in a Docker container as well! you'll get a few hits. As we already have a database running, we need an image just containing ORDS and fire that up - in this case the image lucassampsouza/ords_apex:3.0.9. It is version 3.0.9, but of course you can upgrade it yourself - or just wait for a newer version. The --network switch adds this new container to the network immediately. I can reference the hostname of the database - normally the name or IP-address of the machine where the database is running on - by the name of the container, "oracle". I defined (another) volume mapping for this container in a way my APEX images directory is located on my local machine. Thus I can easily patch or update APEX without touching the container. If this container gets blown away ... I just fire up a new one with this same command and I am ready to go. So this complete configuration is totally ephemeral (love using that word again) as all important data is stored on my local disk. And I can easily burn or replace containers - for instance when a new version of the ORDS or AOP image comes available. Now go and try it yourself!